but then it started showing up on the blogosphere. first i saw gail's version, then this one, then this one, and i knew i had to try it. maya's preference for casual/less girly dresses and tunics made her the perfect candidate for a trial run. 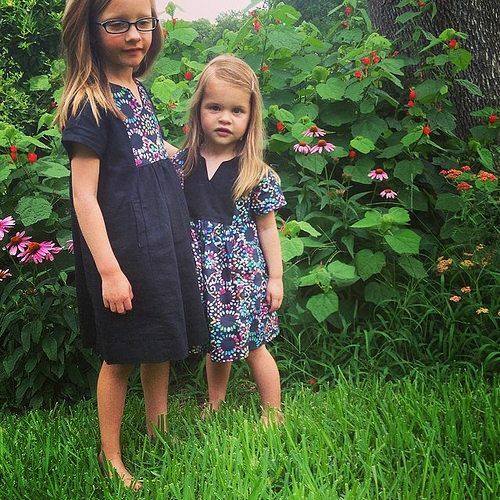 using fabric left over from nora and etta's back to school library dresses i set to work. 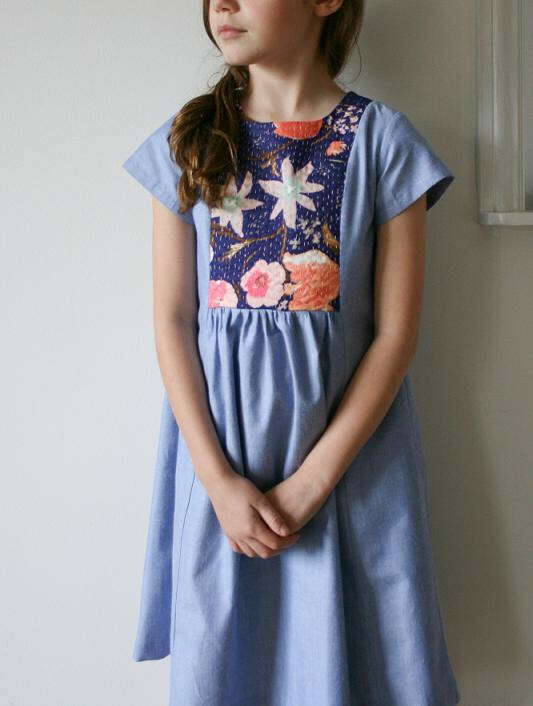 not surprisingly (it is oliver + s after all) the pattern came together perfectly, even with me going outside the lines and adding flat piping in the accent color and finishing the hem with an accent facing (as i had with nora and etta's dresses). i love the faux welt pocket on the side seam and all the top stitching. and the fit is perfect for a very active little girl. since i had already made things for three girls from this fabric combo (paisley print from the fabric depot in portland, oregon and solid yellow cotton kona from stonemountain & daughter in berkeley, california) i felt the need to make neela something. i know, me wanting to make sure the youngest was included? shocking. i was facing some serious fabric limitations at this point. i had originally planned to make, and bought fabric for, two roller skate dresses. i had already made two library dresses and a hide & seek dress. so i did what one always does in those situations: i had an oatmeal stout and turned to oliver + s.
i managed to squeeze out a music box jumper bodice out of the scraps. for the skirt i used the larger (relatively speaking) pieces to cut four rectangles, added some (very small) pleats, and found my self with a tunic length finished product (hey she is 7 months old, tunics and dresses are interchangeable). as with maya's dress i used the accent fabric for flat piping and hem facing. my sister loves the girls dressed in coordinating outfits. i believe her exact words at this point were "i got you sissy i got you"